As it turns out, renovations take a lot longer in planning than what I had anticipated. I am the first to admit that patience is not my virtue, but to my credit, I have been waiting for YEARS to get these renovations done. We will first get the floors done, but even that has been a lot more difficult than I expected. Turns out we have timber floorboards (well, I knew this) that might not be easy to remove (this I didn't know). I have had a couple of attempts to get them sanded and stained, but haven't been too happy with the results. So laminate it is and hopefully we can get them in without too much trouble (touch wood, pun not intended). We are going with a lot lighter boards (the reason I am changing the floors in the first place) and hopefully can get them done before Easter! 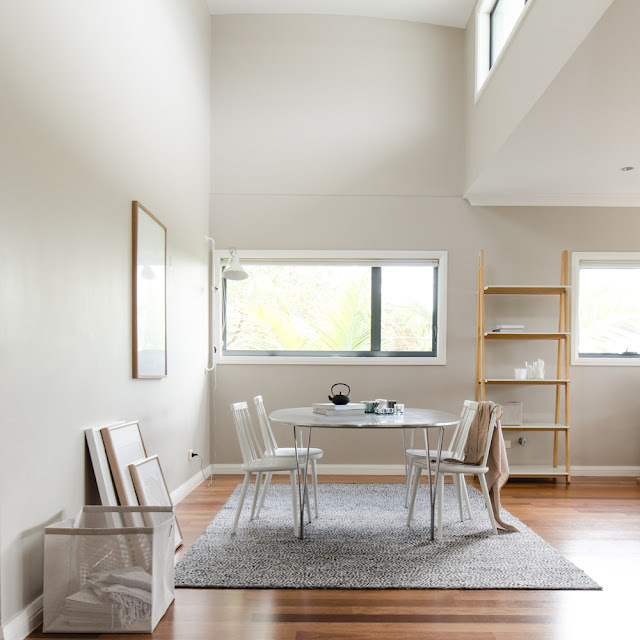 Longer term plan is to create an extra room at the attic (which in the above photo is on your left) and place a permanent staircase where the dining table currently lives. Weather it is structurally possible and how much it would actually cost, will remain to be seen. Stay tuned for more updates and in the mean while, lets take a moment to appreciate the size of that Woodnotes basket. It fits magazines, blankets, toys, a four year old girl, just about anything. Like their ingenious beach bags, these baskets are also made from paper yarn. They are super durable and I just love the look of them.